"For somebody who has achieved what he has done, the difference between being a good athlete and a great athlete is somebody who can pull motivation out of nowhere. ... David is Olympic champion, world champion, record holder you might wonder, what next? What can he do? What is left to achieve? Great athletes can be able to move a notch higher in their motivation and that is something David has to look at this season." - Brother Colm O'Connell talking about the great David Rudisha, who didn't be seeming to be lacking in motivation when he opened his 2013 campaign on Friday with a 45.15 PR (45.50 previous PR). How long could you stay in solitary confinement if you get paid $10k per day? *With Alysia Montano Out, Who Will Win $5,000 In Women's 800? Road Action: Allan Kiprono To Defend His Bloomsday 12k Title This Sunday Against Abdi Abdirahman And 2012 10k World Leader Emmanuel Bett (26:51) Past champions Simon Ndirangu and Gilbert Okari are also in the field as well as US's Brent Vaughn. For the women, 2011 champ Misiker Mekonnin will attempt to regain her crown while Alice Kimutai is the top seed with a 31:51 10k earlier this year. Asafa Powell Is Approaching His Season Much More Cautiously Now And Will Only Do 2 Races Before The Jamaican National Trials He talks about all the extra things he's added this year in an attempt to stay healthy. SA's Olympic Silver Medalist khotso Mokena Long Jumps Over Crocodiles Mokena: "This was something I've wanted to do for a very long time. It was about testing myself, my mental strength and overcoming the fear ... I think I'm half-man, half-croc." UK Olympic Discus Thrower Lawrence Okoye On Joining The 49ers: "I don't want to look back in 50 years time and say, 'I could have done that ... If I fail, I fail, but I won't look back with regrets." Japanese High School Head Coach Disciplined For Use of Corporal Punishment Retires "For Personal Reasons"
Diego Estrada And Betsy Saina Are USTFCCCA DI Athletes Of The Week For Their Payton Jordan Performances Estrada ran 13:15.33, which is the second fastest by a collegian outdoors, only behind Henry Rono's 13:08.4 from 1978. Saina ran 31:37.22, winning by 7 seconds with the No. 3 all-time collegiate mark. NAU Head Coach Eric Heins On Estrada's 13:15: "I think Diego took a big step forward tonight in establishing himself as a world-class runner." Emma Coburn On Just Holding Off Jamie Cheever: "In the steeple, if you are tired, you are tired. There isn't another gear you can change to with the barriers." 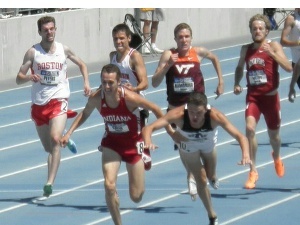 Coburn won 9:28.26 to Cheever's 9:29.13. Britain's Olympic Triathlon Champion Alistair Brownlee Is Trying To Qualify For Selection To The UK Team For 2014 Commonwealth Games He ran 28:32.48, which puts him 22 seconds outside England Athletics' B qualifying standard. Good: Regina Jacobs's Stanford Frosh 800 Record Broken Amy Weissenbach won the 800 in 2:04.24 and also put herself #2 all-time at Stanford. 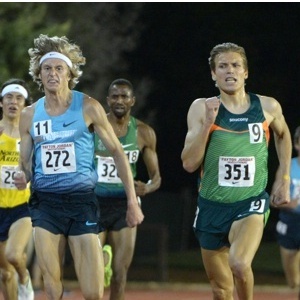 Drake: AJ Acosta Still Sponsor-Less And Having A Rough Start To 2013 With A 4:11 (Kansas), 4:06 (Drake Road), And 4:05 (Drake Track) In His First Three Races He'll race again this weekend at the ReRun San Diego meet with a loaded mile field that includes David Torrence, Ryan Gregson, Donn Cabral, Cam Levins, Zane Robertson and Jordan McNamara. *Lolo Jones Says She's Ready For "Twitter Attacks" After Her 4th Place Finish At Drake "I can take away some positives, but I feel like people will automatically attack me and turn it into something negative." *After Finishing 4th, Hometown Hero Lolo Jones May Skip Future Drake Relays For "Sanity's Sake"
On The Boards: Nick Willis Dominates Drake: 3:55.7 Pumps Up Crowd! Friday: LRC Wow: Jenny Simpson Impresses With Drake Relays Record And World Lead In 1,500 They say the sequel rarely lives up to the original. Well, that wasn't true Friday night in Des Moines as Jenny Simpson's first race since her reunion with Mark Wetmore was simply SENSATIONAL. Mary Cain was way back but got a new HS record. *MB: Tim Hutchens (sic) on Jenny Simpson "The World Champion is Back." LRC Rest Of Friday's Pro Action: A Stunner In The 110 Hurdles, Jenn Suhr Loses, Jeremy Wariner Loses, Brittney Reese Wins All 3 of the Olympic 110 hurdlers were running for $25,000. None of them won as Andrew Riley pulled a stunner. Brittney Reese was very clutch. *Quotes From Friday's Stars Simpson was pumped as her grandpa was a Drake grad. *UK Discus Record Holder And Olympian Lawrence Okoye Decides To Quit Track And Signs With The San Francisco 49ers As An Undrafted Free Agent He's never played football before, but did well in the Combine with 4.78 seconds in the 40 yards, 35 inches in the vertical jump and 125 inches in the broad jump. *Okoye: "I realise it's going to be a ridiculously tough process. I will have to work even harder than everyone else, I have a lot to catch up on." LRC The Seven-Year Itch Is Met: Rita Jeptoo Closes Hard To Win Her Second Title Hometown favorite Shalane Flanagan closed hard but not fast enough to give the US its first win since 1985. 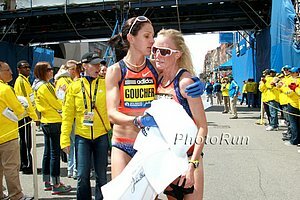 LRC Shalane Flanagan And Kara Goucher On The Beauty And Emotion Of The Boston Marathon Even before the bombings, emotions were running high for Goucher and Flanagan. We talk about their tears, the pro-American crowd and media, the incredile Joan Benoit Samuelson and even what Kara and Shalane do when there isn't time to go to the Porta Potty but a race you've trained a lifetime for is about to start. Japanese 100m HS Sensation Yoshihide Kiryu To Face Sub-10 Performers Mike Rodgers, Mookie Salaam And Derrick Atkins Bershawn Jackson is going to be at the meet and pumped as well. "I'm looking forward to seeing him more than my own race." *Jamaican Columnist: Japanese Teen's Success Proves Stereotypes Are Wrong "To find out if blacks have an inbuilt, inherent advantage in sprinting over whites, what we should be doing is racing three-year-olds of all races, when they are largely 'untouched,' and less affected, by cultural and social differences. If all the black toddlers start beating all the white toddlers, the theory has merit." *Tyson Gay Is There Tyson Gay Has Given Up Fast Food "I ate fast-food all the time. There are seven days in a week and I would eat at McDonald's three times a week, at least." 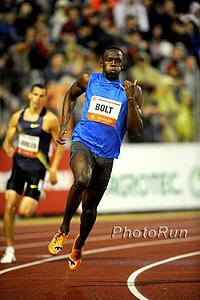 *IAAF Meet Preview Men's 100m features Tyson Gay, Ryan Bailey, Darvis Patton, Nesta Carter and Kemar Bailey-Cole. Shelly-Ann Fraser-Pryce in the 200 vs. Bianca Knight, GB's Christine Ohuruogu in 400, Dawn Harper vs. Queen Harrison rematch in the 100H, bronze medallist Warren Weir, Wallace Spearmon and Nickel Ashmeade in the 200. Olympic silver winner Luguelin Santos in 400. 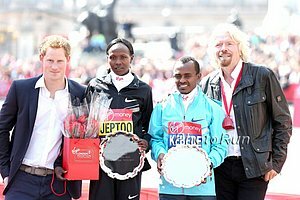 Road Action Sunday: Preview Of Sunday's BIG 25 Berlin 25k: 2011 World Marathon Silver Medalist Vincent Kipruto Leads Men's Field Over Jacob Kendagor (Recent 59:36 Half) & Ghirmay Ghebreslassie (60:09 Half) In the women's race, Lucy Kabuu (66:09 at RAK Half Marathon) will try to break Mary Keitany's 1:19:53 WR (5:08 pace) and will face 2011 Boston champ Caroline Kilel. 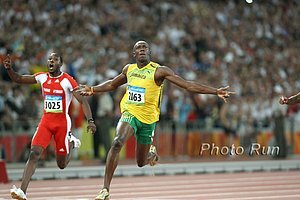 Saturday: Usain Bolt Pulls Out Of This Weekend's Jamaican Invitational With A Slight Hamstring Strain He's hoping he might be good to go by next week's Cayman Invitational. *MB: Down goes Bolt! Down goes Bolt! Tyson Gay Is A Last Minute Addition To Jamaica Invitational He'll face US's Ryan Bailey and Jamaican 4 x 100 gold medalists Nesta Carter and Kemar Bailey-Cole as well as 60m NR holder Lerone Clarke. May 10th: IAAF Look At The Deep Fields Set For May 10th Doha DL Meet David Rudisha vs. Mohamed Aman in the 800, World indoor champion Genzebe Dibaba vs. former compatriot (who is now representing Sweden) Abeba Aregawi in the 1,500, Hagos Gebrhiwet and Yenew Alamirew in the 3,000, World indoor bronze medallist Mekonnen Gebremedhin in the 1,500 and Olympic bronze medallist Sofia Assefa and World XC silver medallist Hiwot Ayalew in the women's steeplechase. Can someone explain the U. of Penn Track config to me? 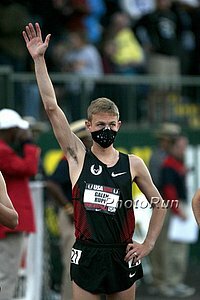 Penn: Day 2 LRC Men's DMR: Penn State & Robbie Creese Do It Again - Bayer 3:55 Some guys have "it" and Robbie Creese is one. He isn't afraid to run in the front at Penn Relays and he blitzed the final 200 to give PSU its third COA title in two years in 9:24. LRC 4 x 1,500: Michigan's All-In Bet Is Rewarded The Wolverines, Ducks and Wildcats all ran three of the fastest 10 times in Penn Relays history but the amazing 5th year of Amanda Eccleston continued as Michigan got the win. Sean McGorty 4:04.47 We were impressed with McGorty's solo 8:46 last week and that carried over to Penn where he set a US HS leader. Day 1: LRC Villanova Wins Record 11th DMR Title With Michigan a scratch, the Wildcats were the class of the field and ran like it as they defended their crown from last year. Plus we recap the HS girls distance action. *Touching: Villanova Dedicates DMR Victory To Associate AD Who Died Suddenly At Age 25 On April 16th "A year ago, when we won Penn Relays, he handed us our wheel," Lipari said. "He's always been a huge supporter of Villanova track and field and the whole athletic community at Villanova so we wanted to support him the way he always supported us." Paula Radcliffe Speaks Out Against Spanish Court's Decision To Destroy Evidence Seized In Police Raids In Operacion Puerto Doping Scandal "It is very frustrating when globally the momentum is moving towards supporting anti-doping in a very positive direction with the actions of Usada and the recent clean-up in cycling ... The Spanish haven't used the opportunity they had to make sport a lot cleaner and to improve their reputation." 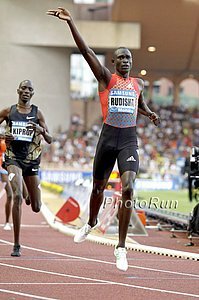 RRW: 2012 Comrades Winner Ludwick Mambolo Cleared Of Doping Charges Both Mamabolo's "A" and "B" samples showed the presence of the illegal drug, but according to his lawyer "there was a system failure in the Comrades doping process." Inquiry Committee Into Mamabolo Testing Process Says It Was Chaotic And Had Several Occasions Where His Samples Could Have Been Contaminated Things including involvement of under-qualified officials, mishandling of samples, and contradictions between documents signed by officials on race day and evidence that was given. Mamabolo: "I am delighted that I now have my good name and livelihood back." LRC Jenny Simpson, Eric Jenkins, Diego Estrada, Mac Fleet, Chris Solinsky, The PSU Men And Villanova Women Impress, The Mystery That Is German Fernandez This week, we heap praise on Diego Estrada, Eric Jenkins, Mac Fleet, Chris Solinsky and the PSU men, but give the most to the Villanova women. Along the way, we slam the Arkansas men, talk about Jordan Hasay and the mystery that is German Fernandez and announce Lawrence Okoye, a future NFL star for the San Francisco 49ers. Plus a 17-year-old runs 10.01 – and he's from Japan. 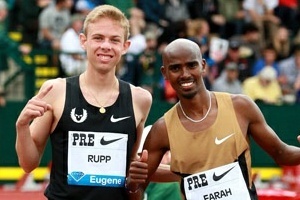 Results From Drake Relays Road Races: Deep Prize Money Generated Some Competitive Fields Emmanuel Bett won the 10k in 28:23 over Kenneth Kipkemoi (28:29). 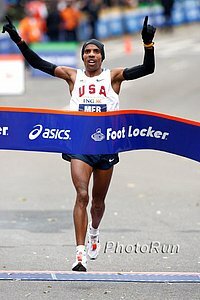 Mark Kiptoo won the half marathon in 1:02:27 as the top 5 were all within 8 seconds of each other. Three More Arrested In Connection With Boston Bombing For Trying To Remove Evidence From Dzhokhar Tsarnaev's Dorm Room None of them are accused of any direct involvement in the bombings, but are being charged with conspiring to obstruct justice and making false statements to federal investigators. Researchers Say The Day Of The Boston Bombings Was The "Saddest Day In Twitter History" It's interesting how they monitor the mood of each day by assigning more than 10,000 words a mood score between 1 and 9, most negative to most positive. EBay Monitoring Listings Of Boston Marathon Medals Being Auctioned Off Some are being sold with the proceeds going to charity. IAAF Good Q&A With David Rudisha's Coach, Brother Colm O'Connell "I am certain he can still improve on the 1:40.91 he ran in London ... But, frankly, I don't think 1:40 or below is going to be possible soon. 1:40 cannot be broken in the next two or three years. It will take time: 1:40.9, 1:40.8, etc. The question is, will he last long enough?" Which Americans Can Go To Worlds?